The turbine body was based around a block of wood with holes for the horizontal and vertical axle bored in separate faces. The front of the block was lined with 1mm galvanised sheet with holes to locate the stator torque bolts. 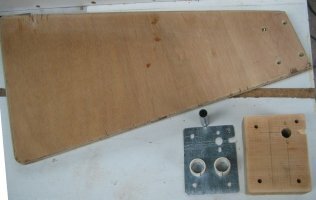 The vertical axle was the same piece of piping used in the original but the body had small sections of split PVC tube pushed into the wooden block as bearings. 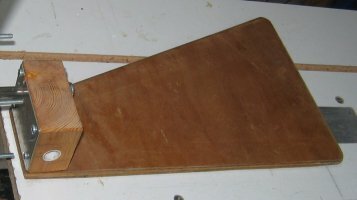 The tail was cut from 9mm plywood and screwed to the side of the wooden block with a slight angle to counteract the offset of the vertical and horizontal axes.